got out to adjust luggage rack and notice his leg bleeding "One of the more puzzling aspects of the quadruple murder case against Christopher Vaughn is his reported statement that the Vaughn family was on its way to Springfield to spend the day at Knight’s Action Park. It is unclear why the Vaughns, who lived in Oswego and had no apparent ties to the capital city, would have chosen to visit a water park in Springfield. Oswego is about a three-hour drive." "He allegedly told authorities his wife was feeling sick, so he pulled onto the frontage road. He got out to adjust the luggage rack on top of the vehicle and moments later noticed his leg was bleeding, according to a report in the Chicago Tribune. He told his wife he was going to get help, flagged down a truck and asked the driver to call 911"
5:25 AM EST Channahon police received a 911 call around 5:25 a.m. from a passer-by who found Christopher Vaughn near the scene with a gunshot wound to his thigh. Channahon police notified state police who closed off the southwest frontage road of Interstate 55 near Bluff Road." "Will County Coroner Patrick K. O'Neil said an autopsy performed Thursday showed the three children died as the result of multiple gunshot wounds and Kimberly Vaughn died from a single gunshot wound." Thursday "Vaughn stood with the caller until police arrived, Illinois State Police Capt. Carl Dobrich said. A handgun was found at the scene, but officials declined to say who the suspected shooter was, other than it was an apparent domestic dispute." 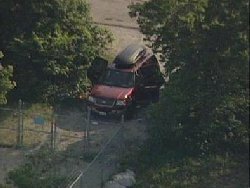 [06/14/2007 HEADLINE: "Ill. Police Find Mother, 3 Children Dead In SUV"
and the kids "The exact spot of the shootings continues to puzzle investigators. Just off busy I-55, but on a frontage road with no way back on. And instead of pulling over to the side of the road to fix what he claimed was a loose luggage strap, Chris Vaughn pulled into the only driveway between trees that blocked whatever he was doing from passersby. That’s where the buddy of a man CBS 2 spoke came upon Vaughn that morning. The two are employees at a nearby gravel hauling firm. Vaughn was allegedly staggering along the road, bleeding and muttering "shot my kids." Others who spoke to the man tell CBS 2 Vaughn told him his wife shot him and the kids. But one investigator reportedly told a friend he was skeptical of the claim given the angle of Vaughn's bullet wound. Several of the man's associates said the Bolingbrook man told them he thought Vaughn was drunk when he spotted him stumbling in the roadway. But the caller stopped his vehicle anyway and let Vaughn in. That's when the 32-year-old Oswego man showed his wounded thigh. The 911 caller then walked over to the Ford Expedition, saw the blood spatter on the window and stopped in his tracks. It's an image his associates say he's still trying to forget." 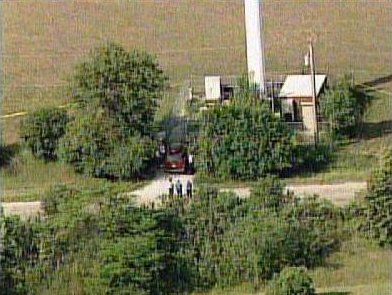 June 19, 2007 HEADLINE: Key Forensic Evidence Expected In Vaughn Murders - Investigators Hope Ballistics And Other Evidence Will Lead To Killer" CBS 2's Mike Puccinelli and Jay Levine contributed to this report. "We are withholding providing identification of who we believe the victims are until we can notify next of kin," Illinois District 5 Capt. Ken Kaupas told reporters at a news conference Thursday. "That has not been positively confirmed yet, but will be shortly." - "Channahon Mayor Joe Cook said the murders appeared to have been a case of domestic violence." Christopher Vaughn has a firearm owner’s identification card; his wife does not "State police investigators were seen going door to door in the Oswego neighborhood where the Vaughn family lived. Four members of that family were found shot to death inside an SUV in Will County this week. Now, a family member is speaking out in defense of her deceased loved one. Susan Philips says it makes no sense. In an interview with the Sun Times, the mother of 34-year-old Kimberly Vaughn says she doesn’t believe the story her son-in-law Christopher has reportedly recounted for investigators." Thursday, the CBS 2 Investigators learned that cell phones were found in the SUV where Kimberly Vaughn and her three children were found. Police are investigating why Christopher Vaughn apparently did not use a phone to call 911 for help. Instead, a passerby made the call when they found Vaughn wounded near the vehicle. The 2 Investigators also learned that Christopher Vaughn has a firearm owner’s identification card; his wife does not. 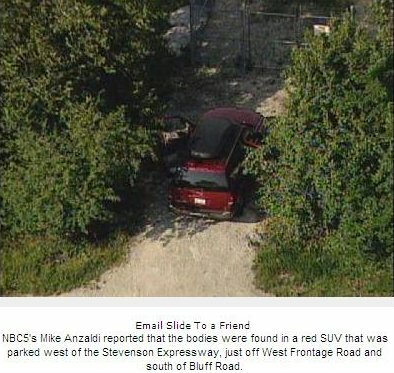 2004 Ford Expedition registered to Stone Bridge Security, Inc. of Aurora, Ill The bodies were found in a vehicle parked off a frontage road of I-55 in Channahon Township, Ill. FOX affiliate WFLD-TV reported that the vehicle was registered to Stone Bridge Security, Inc. of Aurora, Ill.Will County sheriff's deputies are assisting the Illinois State Police with the investigation. Channahon is a community of approximately 11,250 people in northeast Illinois." Shooting ? Sources told CBS 2 that Christopher Vaughn initially claimed to be a victim of a drive-by shooting and then tried to shift the blame to his wife, but investigators wouldn't confirm that." Canines and state police aircraft brought in to search the area "Authorities continued to monitor the scene, which is surrounded by corn and bean fields, Dobrich said. "We have deployed canines and state police aircraft to search the area; to cover that base to make sure that we haven't missed anything," Dobrich said." Thursday Christopher Vaughn was taken to Provena Saint Joseph Medical Center in Joliet, where he was treated and released. After his release from the hospital he was taken to state police District 5 Headquarters in Lockport where he was interviewed by investigators. Left Thigh "While at the Provena St. Joseph Medical Center emergency room in Joliet on June 14, where he was being treated for a gunshot wound in his left thigh and a graze wound in his left wrist, he told police that his wife felt sick, so he pulled onto a frontage road, then onto a tree-shaded cell-tower access road in Channahon Township, the sources said. He said he got out to adjust a luggage rack atop the SUV and, while getting back in the vehicle, noticed his leg was bleeding, the sources said. Vaughn said he told Kimberly he was going for help, the sources said. He flagged down a passerby in a black truck, and asked him to call 911, police said." Residue "Investigators also released new details about gunpowder residue found at the scene. A source Sunday clarified that gunpowder residue was found throughout the inside of the SUV, but not enough was found on Kimberly Vaughn's hands to indicate she had fired a weapon." Vaughn said he didn't hear any gunshots "While at the hospital, Vaughn asked whether someone had notified his wife, adding that she gets upset when she doesn't know where he is, the sources said. He told police his family left their Oswego home before 5 a.m., to go to a Springfield water park and return home in time for a soccer game one of his daughters was to play in that afternoon. He also mentioned that he and his wife planned to go to Missouri for the weekend, to stay at the bed and breakfast where they honeymooned in their home state more than a decade ago. Vaughn told police he could not remember what happened after he was wounded and did not hear any gunshots, the sources said." Vaughn told police he can't remember what happened, asked if his wife had been told "In the hours immediately after his wife and children were found dead in their family sport-utility vehicle off Interstate Highway 55 in rural Will County,a wounded Chris Vaughn told police he could not remember what happened to him and his family, according to sources close to the investigation. Vaughn, 32, of Oswego said he knew only that he had been wounded and had gone for help, the sources said. He asked if his wife, Kimberly, had been told what happened to him, the sources said." Luggage Rack? "He also said he had not placed a handgun in the SUV, the sources said. The handgun used in the incident was found in the SUV, as was at least one cell phone, the sources said. Computer removed Police initially searched the home on June 14, the day of the shootings, and removed at least one computer along with other items. Schnauzer, Golden Retriever "A neighbor helped police remove two dogs from the Vaughn house on Mansfield Court in Oswego, where the family lived for more than a year." Schnauzer, Golden Retriever taken to shelter by Kendall County Animal Control "The Vaughn family's dogs, a golden retriever and schnauzer, were taken Thursday afternoon to an animal shelter, next-door neighbor Susan Stasinos said. Oswego police said the family pets were taken by Kendall County Animal Control, although staff there did not return calls seeking comment. Anne Vickery, who serves on Kendall County Board's Animal Control Committee, said the dogs will not be euthanized. "She would never leave her dogs," Stasinos said of Kimberly Vaughn. "She loved her dogs like her kids. It doesn't make sense she would leave her dogs and go away to a water park for the day." woodworking shop "Neighbors described him as a loving family man who frequently tooled around a woodworking shop he built in his garage. He was an avid outdoorsman, holding fishing and hunting permits. "He is great guy, very active, very loving," said a neighbor who didn't want to be named. Neighbors said Kimberly was just about to complete an online degree in criminal justice administration. She recently took a job as an attendant at a subdivision clubhouse. "She was a homemaker," the neighbor said. "She loved to cook and read, and everything centered around her kids and their activities. She was just a very spirited and energetic person who loved life. She was very talkative, social and got along with everyone." Wounded dad says wife pulled the trigger, police say 'he is not a suspect at this time' after bodies found in SUV"
Oswego Neighbors say Vaughn's were a loving family "They was loving and would do everything for the kids,” said neighbor Sarmad Faiz. Faiz, the neighbor next door, saw and spoke to the mother and her children nearly every day. "They were a great family,” Faiz said. “I was shocked when I heard about it. You wouldn't expect something like that out here." "Residents say Kimberly Vaughn volunteered at the subdivision's clubhouse. "She was willing to give of herself, that was a volunteer effort,” said neighbor Dana Smith. No one saw any signs of trouble in the family. “Nothing has happened to indicate a tragedy of this magnitude,” Smith said"
Kimberly's mother talks to Christopher Vaughn for two minutes "Phillips talked to her son-in-law for the first time since the shootings on Friday "for two minutes." "He sounded groggy and said, 'I don't know what to say,' and I said, 'I don't know what to say, either.' " - "She said she thought Kimberly and the children "should be brought home" to the St. Charles area for a funeral and burial, and he agreed. She gave him the name of a funeral home. That was the end of the conversation. No questions, no discussion about what happened Thursday." Kimberly's mother said Christopher Vaughn doted on his wife ""She wasn't a spendthrift. She had what she wanted," her mother said. And neighbors said the Vaughns enjoyed dining out and going to the movies regularly. Phillips said her son-in-law doted on his wife. "After he started making money, he gave her this beautiful diamond ring. She was his princess." And when she decided to return to school, completing a criminal justice administration degree through the University of Phoenix online program, Christopher was right there, urging her on and writing the checks for tuition, Phillips said." Oswego Community Schools "Cassandra Ellen “Sandi” Vaughn and her brother, Blake Vaughn, attended Old Post Elementary School and the oldest child, Abigayle Elizabeth “Abbi” Vaughn, attended Thompson Junior High School. Last Friday, Oswego School District officials held a meeting for interested parents and to offer counseling services at Old Post Elementary School. About 10 families attended the session, and were also referred to other counseling services in the community if they felt the need to use them, officials said. A similar session was held at Thompson Junior High School. " to pick up his pets "Chris' parents, Pierre and Gail Vaughn, drove in from Missouri overnight, catching up with their son at a hotel before noon Friday, said his aunt, Nancy VanWilder. They got him something to eat and tended to his two gunshot wounds, one of which was on the thigh as police described a day earlier. VanWilder said she did not know where else he was wounded. "He's suffering from these wounds, and he's in a state of shock," she said. "He's quiet. He's just hurting. He's devastated. He didn't want to go to his home. He didn't want to pick up the pets." "The (luggage) carrier's been on for months" "The Vaughns' neighbors described Kimberly as a doting mother. They talked of how she walked her children to the bus stop each day, holding it for one of Blake's friends if the bus driver started to leave. "That's not the person I saw here every day," Stasinos said. "She played in the back yard with them. They seemed like the perfect, all-American family. They loved their kids. I never saw a family that paid so much attention to their kids." "It just doesn't make sense," Stasinos said Friday. "There's something not right. The (luggage) carrier's been on for months. They've never had a problem with it." "They're trying to say she did all those things," said another neighbor, who declined to give her name. Kimberly Vaughn often stopped by her house for visits, the neighbor said. "We don't believe it for a second," she said. Kimberly Vaughn was "a very good mother, a loving person," she said. "She was always happy. I never noticed anything was wrong. Stasinos said she and her husband wondered if the slayings were somehow connected to Christopher Vaughn's work, especially since there was a gun in the family's Ford Expedition. "Why would you take it on vacation?" she asked." 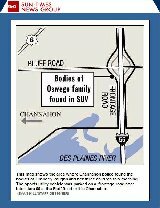 06/16/2007 Headline: "Neighbors are left reeling from Oswego family Tragedy"
"There is no way I would believe it was her," said Kim Vaughn's sister, Nikki Isemann. "There is no way she would have hurt her children." She could not bear to see her children cry, and was so averse to them experiencing pain that she couldn't remove their splinters, Isemann said. "When I talked to her, she was absolutely happy," her sister said, noting that she last spoke with Vaughn during a phone call at 8:55 p.m. Wednesday. "She was in great spirits, very excited about her future." Wednesday night, neighbors went to the Vaughn home for dinner. Nothing appeared amiss, said one guest, who declined to be identified." 06/16/2007 Headline: "Officials say killer was 1 of family - Cops examine ballistic evidence as they piece together slayings"
Vaughn's Neighbors Reaction "Neighbor Jewel Leggett said she never heard the couple, nor their children, fight. The children often played outside with their father when he was home, she said. "She always wanted to go over there and play with the kids," Leggett said of her 3-1/2-year-old daughter. Her husband and Christopher Vaughn have a mutual love of Jeeps, she added. 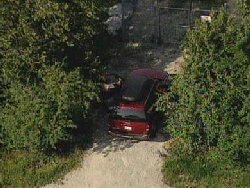 A Jeep was parked in Vaughn's driveway in the 700 block of Mansfield Court Friday. "He seemed very loving, always playing ball," Leggett said." "I knew Kim and her children. She loved her kids to much to commit such a thing. She was always very protective of them. We shared times at Thompson Junior High in Oswego when Abbey ran in Cross Country with my son. Those were very good times. One time Abby had a broken hand due to falling off her bike and kim immediately made an appointment and took her to the Doctor and she got a pretty cast. Blake and Cassandra always played with my younger daughter. They all seem so happy. Kim was so happy about her studies and looking forward to the future. What happened? Herhusband's story does not add up. Look at what he does for a living. I hope there is a deep investigation. Now how can I explain to my 7 year old what happened to her friends." 06/16/2007 Topix Thread Titled: "Oswego mom, children killed"
the back yard "At least one neighbor who was friends with the Vaughns said he saw no sign they were having any marital or financial problems. They dined out and saw movies regularly, they had just bought an Olympic-sized volleyball net for the back yard and they didn't seem to hesitate to spend money on their children, the neighbor said." 06/16/2007 Headline: "Investigators delve into Vaughn family"
2007-06-18 "Chris Vaughn was interviewed for 10 hours and released Friday morning, only to return both Saturday and Sunday for more questioning on how his wife and three children died of bullet wounds in their SUV on their way to a water park." - "Kim Vaughn's family said she would never hurt her children. Her sister, Nikki Isemann told NBC5's Amy Jacobson that there is no way she would commit this act. Isemann said her sister was a loving mother and wife and did not speak of any problems in the family. And Isemann said she doesn't understand why they would go to a water park or leave at 5 a.m." - "Vaughn works for Navigant Consulting downtown on South Wacker Avenue, and as a side job, he owns Southbridge Investigations, studying computer forensics." 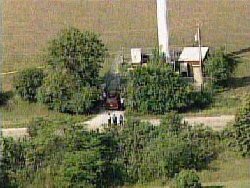 2007-06-19 "The key to the Vaughn family murders is in an unmarked and nondescript building near old Joliet Prison. It’s the state police crime lab, where the blood and DNA evidence collected from the car and the victims is still being processed." 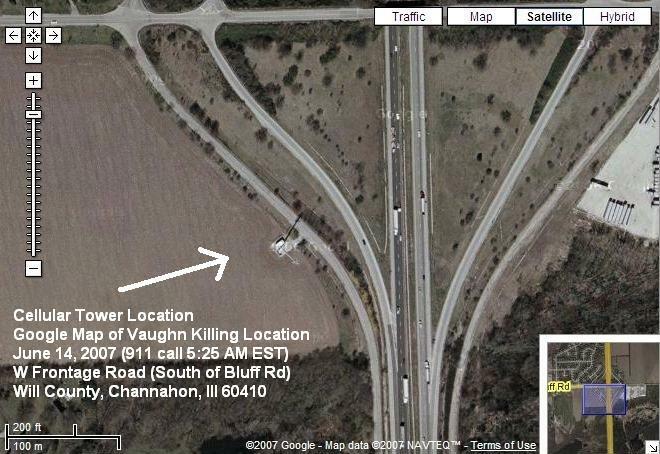 - "The evidence will tell whether Chris Vaughn's blood was also in the car, where he claims he was shot by his wife. Her body was found in the front passenger’s seat and the three children still belted in the back." "Yes, we are neighbors. I just rode by there (9:10 p.m.) since there has been so much discussion about whether the area is lighted by the tower. I go by it a lot in the daytime on I-55 or on Bluff, but rarely at nite. There are NO lights by the cell tower at all. The only light is a highway light south of the tower area & it does not light up that area at all. In fact, that road is downright scary at nite, turning off Bluff onto that frontage road, it's all tree lined on each side & it's VERY dark leading up to the cell tower small road, in fact I had to watch for it or would have missed it. Seems someone was looking for a dark area rather than one well lit to check their luggage rack!" 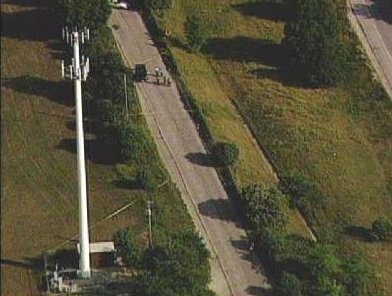 06/19/2007 www.websleuths.com Thread Title: "Woman, 3 Children Found Dead in SUV "
I just rode past the cell tower where this happened. After reading so many posts wondering about the area, I decided to see it at nite. I live less than 5 minutes from it. 1. The exit one mile before this one is WELL LIT, has a gas station & a McDonalds and another gas station just on the other side of the exit. 2. This exit where it happened (Bluff Rd.) is a small exit, no towns indicated or anything, just an exit #. 3. There is NO LIGHT by the cell tower at all. It is very DARK there by those trees. 4. On the sides of the road leading to the cell tower, it is all tree lined on each side & very dark, almost eerie at nite & the road is a very small two lane, almost like you are on a country road. 6. The road actually circles around & leads back into Channahon. 7. There are NO houses on that road the direction he was going. 8. 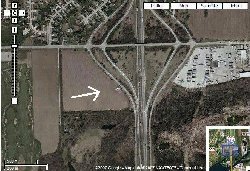 There is a subdision in the north direction of that road to the north of Bluff road, but he turned south on the frontage road off of Bluff. 9. He could have walked to the marina, but it is not visible, it is a ways down the dark road & not marked & is past a curve in the road where he would not be aware of anything being there at all. 10. 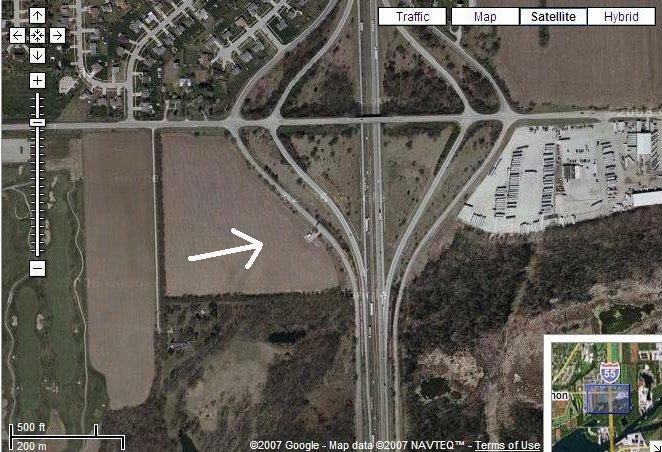 If he walked the other way on the frontage road he would go past the subdivision & end up back at the McDonalds exit. 11. There are lights on the highway, but they are south of the tower enough that it DOES NOT light up the area by the tower at all. 12. You really would have to have lived near here to be aware of this road & that there were no houses or anything for quite a while in that area. 13. Oswego is not that close that living in Oswego you would know about side roads in Channahon. 14. There is some farm field behind the cell tower area & beyond that is a golf course, so no lights at all behind this area at any time. This is what I can tell you of the area. If you have any questions about the area itself, I can tell you as I have lived here many years. Hope this helps clear up about the cell tower & lights." Modems "On Wednesday, Illinois State Police investigators returned to search the family's empty Oswego home, removing three computers, a printer/ fax machine and some DVDs or computer discs, according to neighbors. The investigators, who spent about an hour inside the home, also took out cable boxes and modems and other computer equipment, State Police said in a statement. Police initially searched the home on June 14, the day of the shootings, and removed at least one computer along with other items. Christopher Vaughn is with his parents in suburban St. Louis, where the wake for his family will be held Friday. The funeral is planned for Saturday." TiVo or VCR "Several neighbors said four unmarked squad cars, driven by detectives who had canvassed the neighborhood after the June 14 deaths of three young children and their mother off Interstate Highway 55 in rural Will County, were outside the home. One neighbor, Susan Stasinos, said she saw police remove an electronic component that "looked like a TiVo or VCR." Vaughn's computer business license not renewed December 2006 "The Illinois Sate Police are thoroughly investigating this case. We have many agents on this case. It is top priority here in District 5," said Trooper Mark Dorencz, Illinois State Police. Sources tell ABC7 news that the computers taken Wednesday will be searched for e-mail and bank account information, evidence that may lead to a motive for the shooting. Sources also say they were having financial problems. Christopher Vaughn owned a computer fraud and cyberfraud investigation firm but failed to renew its business license last December." 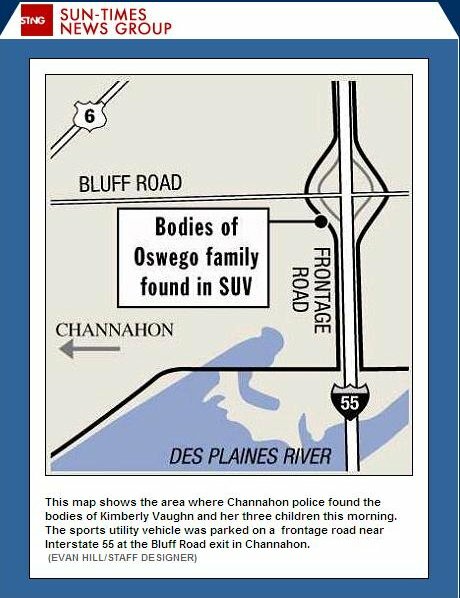 06/20/2007 Authorities search home of Oswego family found dead in SUV"
Christopher Vaughn claimed he confessed to Kimberly that he had an affair during out of town business trip "Sources tell NBC5 Vaughn recently confessed to his wife that he had an affair while out of town on a business trip. Investigators also questioned Kimberly Vaughn's parents and sisters about the alleged affair. Joe Jacobson, a spokesman for the slain family, called the alleged affair a "made-up motive" to make wife Kim look bad, maintaining that she would have left Chris if she knew he was cheating -- and she would have taken the children with her. "He supposedly told her that he was having an affair, and if they were having that conversation, she would have talked to her sister or her mother," Jacobson said, adding that Kim's parents always thought the couple were devoted to each other.."
06/20/2007 Sources: Vaughn Had Affair While On Business Trip - Spokesman Says Wife Would Have Left Vaughn"
At the risk of people slamming me here- I just want to say something. I have driven that road many times- mainly to go boating. It dead ends at river pub called the Big Basin Saloon. However, if you are going south on 55 and pull over on Bluff Road, to get BACK on the highway you have to PASS the frontage road because the onramp to 55 is the NEXT road. It can be very confusing! He may have pulled off onto Bluff, fixed the luggage rack, and then THOUGHT he was pulling back on to the highway and accidently went down the frontage road- it's very easy to do. When 55 was under contruction I took the "back roads" plenty of times and even knowing where I was going I made the mistake of pulling down that road thinking it was the on ramp to 55." 06/20/2007 Topix Thread Titled: "Oswego mom, children killed"
Neighbors said Vaughn would often leave on Tuesdays and come home the following Sunday "Vaughn works for Navigant Consulting and often traveled to Utah, Washington state and Mexico. Neighbors said he would often leave on Tuesdays and come home the following Sunday. State police are checking his movement in several states, looking at credit card and cell phone records. Navigant Consulting confirmed they are working with investigators about past business trips." Attorney Joe Jacobson is spokesperson for Phillips family "Joe Jacobson is a friend of Kimberly Vaughn's father. The Clayton attorney is now acting as a spokesperson. Jacobson says, "My understanding is they have spoken to various police and are cooperating as fully as they can and providing anything the authorities want." 06/22/2007 HEADLINE: "New Developments In Deaths Of St. Charles County Natives"
No record of obtaining a firearms certificate "Police have said a handgun was found at the scene of the shootings. On Wednesday, state police refused to release information about whether either Christopher or Kimberly Vaughn had Firearm Owner's Identification cards." - "According to Washington state licensing records, Christopher Vaughn was a licensed, unarmed private investigator in that state. The Washington State Criminal Justice Training Commission has no record of Christopher Vaughn obtaining a firearms certificate in connection with his job in that state. According to Washington state law, armed private investigators are required to obtain a firearms certificate through that commission." "Christopher Vaughn does not have a license to work as an investigator in Illinois, according to Illinois Department of Financial and Professional Regulations records. But Sue Hofer, a spokeswoman for the department, said if he operated a computer security business and worked strictly with computer systems, he wouldn't need a state license for that job." Schnauzer, Golden Retriever "Kendall County Animal Control staff have been taking care of the Vaughns' dogs and preparing to turn them over to a member of Kimberly Vaughn's family, said Kendall County Board member Anne Vickery, who received a phone call from Christopher Vaughn authorizing the release of the animals. "We found the dogs in an outside kennel, evidently dropped off by Oswego police," Vickery said of acquiring the dogs last week. "The dogs are fine, evidently in good shape. They're well taken care of." 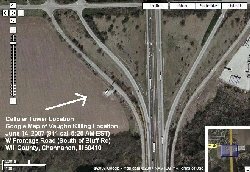 06/22/2007 HEADLINES: Illinois Murder Has Link to ‘Law & Order’ Episode"
Source reportedly said Vaughn considered Divorce "Some witnesses told CBS 2 Christopher Vaughn said his wife shot him and his children. But one investigator reportedly told a friend he was skeptical of the claim given the angle of Vaughn's bullet wound." "If you look closely at a picture of Chris Vaughn taken by a Sun-Times photographer, a bandage is visible on his left wrist. A well-placed source tells CBS 2 it covers a wound made by the same bullet that tore through Vaughn's left thigh. Investigators think that also might be significant." Missouri "The funeral was here because parents of both Christopher and Kimberly Vaughn live about 15 miles apart in St. Charles County. The couple met in St. Charles, got married in 1994 and lived here for a while. Their three children were baptized at New Hope. On Saturday afternoon, about 30 relatives of Kimberly Vaughn's family filed silently past about 100 other mourners. Pictures of Kimberly Vaughn and her children were on display in the entrance hall. The Rev. Christopher James gave a salvation message but conceded that the brutality of these deaths was hard to understand." "Wade Ledbetter, who is married to Kim's twin sister, Jennifer Ledbetter, reflected on the lives of his sister-in-law, nieces and nephew. He said they were a mirror image of his own family. He broke down in tears when he talked about how his wife had always wanted to go to a twin convention with Kim, but they had never gotten around to it. Ledbetter also read a letter from an Oswego, Ill., neighbor of the Vaughns who talked about how he found odd jobs around his home, including pulling weeds, so he could give the children extra money. He said he often played a trivia game with the youngsters, and that Blake had won the most recent game, earning the $3 prize." "Kimberly Vaughn has been described as a doting mother who spent time as a Brownie and Girl Scout leader to her daughters, later serving on the Oswego School District's Character Counts committee. Known as Abbi, Abigayle was considered a gifted artist and an athlete, recently invited to join a select soccer league as a goalkeeper, the position her mom once played. She enjoyed stories of fairies and fantasies. Cassandra had a flair for drama, organizing basement plays performed for relatives. She loved animals but was especially partial to frogs. She wanted to start her own business walking and sitting dogs. And Blake was a boy who memorized Cardinals baseball statistics. He played Little League baseball and was a Cub Scout, eager to be in a gifted third-grade class this fall. Inside the church Saturday, four poster boards — one for each victim — were peppered with photographs, showing the kids at play or their mother's days playing volleyball. Only one of the roughly 100 pictures — a small snapshot of the family — showed Christopher Vaughn."